CAD Forum - How to draw a catenary or other parametric curve in Inventor? The catenary curve (also called a chainette, alysoid, funicular, see wiki) - the curve of hanging chain or cable or other fibre in a homogenous gravitational field - is used in many design tasks. To create a sketch shapes as a catenary in Inventor you can zse the function "Equation curve" and specify the curve parametrically. where a is the parameter of uniform scaling of the curve. 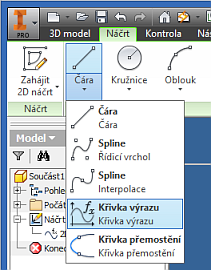 For possible subsequent editing of the curve, you the function "Edit equation curve" from the context menu in the model browser tree. Tip 8884: Sinusoid, hypotrochoid, guilloche and other parametric curves in AutoCAD. Selected tip: Error "Unsupported operating system" when installing Revit LT 2015. Easier scaling of Inventor parts. « | » How to add the unfold rule name as a drawing note?